Cousin Bait is defined by genealogists as putting your research online as bait for unknown cousins to find you and compare information. It works. Late last fall I found another way for cousin bait to work. This time I was contacted by a man through Ancestry.com regarding my husband’s family. I replied to him with confirmation that my husband is a descendant of John Buchanan Fuller who passed away in 1938 in Custer, Nebraska. Our next round of emails revealed the twist. This man was not a cousin. He had purchased items from an estate sale. 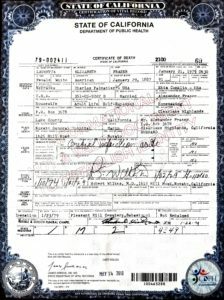 Using the information on the back of a photograph, he had done a search on Ancestry.com to find someone who was researching the family. He had for sale a photograph of the John B. Fuller family together at his funeral. After a couple of quick checks to ensure this was a legit deal, I purchased the photograph. The original photograph from 1938 arrived approximately a week later. I was thrilled to find that not only were names listed on the back of the photograph but someone had written names on the front to indicate who belonged to each name. Fuller Family at funeral of John B Fuller, December 12, 1938. It was time to take a look at the research I had already completed for the family. I was hoping to match up the names on the photograph to the names in my family tree. I was happy to see I had already identified the family unit mostly using census records. John Buchanan Fuller and his wife Emma Jane Shipman had ten children. The first three did not survive childhood. My husband’s great-grandfather, Percy, was the first child to life to be an adult. He was followed by Gladys, Clara, Clarence, Roy, Irene, and Alma. The family was based mostly around the towns of Ord and Custer, Nebraska. I also found an obituary for John B. Fuller that painted a fuller picture of the family and their life in Nebraska. You can read the obituary here. After realizing the names on the photo matched up with the children of John, it was easy to identify the people marked as me and mom. Genevieve, Emma Opal, and Liata are all grandchildren of John B Fuller. Unfortunately, not everyone in the photo is identified. I suspect a couple of the younger people are also grandchildren of John B. Fuller. My mother-in-law was very excited to see this photo. She did not know her grandfather, Percy. Percy and his daughter did not have a good relationship due to Percy and Lauretta Palmatier divorcing when Grandma June was young. This was the first time my husband’s family knew what their family looked like. I have added to photo to FamilySearch so it is available for everyone. I want to make sure it will not be lost to history a second time. If you would like a digital copy of this photo without the names added in I am happy to share my tiff file! Charles Palmatier is my husband’s g-g-grandfather. I have heard stories from my husband’s grandmother about how her grandfather was a Pony Express rider. There are very good records of who worked for the Pony Express and Charles Palmatier was not one of them. The obituary below proves that although the story was not totally accurate, there was definitely a grain of truth in it. This is the longest obituary I have ever found. Charley must have been a well-known and liked man in town. Charles E. Palmatier. 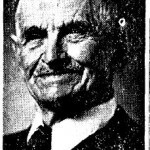 This photo ran with his obituary 7 June 1951 in The Ord Quiz, Ord, Nebraska, page 1 column 2 and page 2, columns 1, 2, 3 and 4. Digital images accessed 6 February 2015 at www.ordlibrary.org (The Ord Library Township Newspaper Archive). Ord Resident Dies After Illness of 10 Days; Friends Mourn. Charles Palmatier, Valley county pioneer and one of the county’s oldest and most highly respected citizens, passed away at the Ord Cooperative hospital early June 1st, at the age of 95 years, three months and twenty-three days. His death was the result of a stroke which he suffered May 23. He was born in New York state in 1856. He leaves to mourn his passing, his beloved wife, Ettie, whom he married in 1884; three sons, Marshall of Wilmington, Calif., Edmund, of Boise, Ida, and Ellery of Chicago; four daughters, Stella Grindey, Loretta Frazier and Grace Rowe of Chicago and Alice Reed of North Hollywood, Calif.; eleven grandchildren, seven great-grandchildren, and one great-great-grandchild, besides his many friends and acquaintances. Mr. Palmatier came to Nebraska in 1878, homesteaded at Geranium in 1879. He was a mail carrier of the early days, and ran the post office at Geranium for 17 years. Leaving the farm in 1910, he was a resident of Ord until the time of his death . A man of absolute integrity, he will long be remembered by the old friends and neighbors who knew him best. Funeral services were held from the Methodist church at 2:30 Sunday afternoon, Rev. R.E. Daughelee officiating, with Hastings and Pearson in charge of arrangements. Lucille Tolen sang, with Mrs. Viola Kellison at the piano. The pall bearers were Elmer Zlomke, Don Dong, Wilbur Rogers, O.E. Patchen, Robert Noll, and M.B. Cummins. Mr. and Mrs. John Haskell had charge of the flowers. Burial was in Graceland cemetery. Charles Palmatier was born in New York state, at Youngsville, Sullivan county, March 9, 1856, and first came to Nebraska in 1878. With him came a friend, John S. Wheeler, who once lived north of Elyria. They walked from Grand Island to St. Paul, and the next day got a job off-bearing brick in a brick yard owned by a man named Dory DeVry. This yard was located on the river near St. Paul. Mr. Palmatier’s next job was working for Zach Leftwich in a mill on Spring Creek, He worked in the mill and also fed hogs. His first work at Ord was teaming in flour for S.S. Haskell, who at that time ran a store in the old Transit House, now located on the corner north of Hotel Ord, but then located about where the U.P. shops used to be. It was a rather risky trip in those days. It took two days each way and camp was usually made over night near Scotia Junction. He stayed over night on some occasions with as much as $40 to $60 in his pocket, and that was a lot of money in those days. He ran quite a chance of being held up and relieved of it, but happened to be lucky. 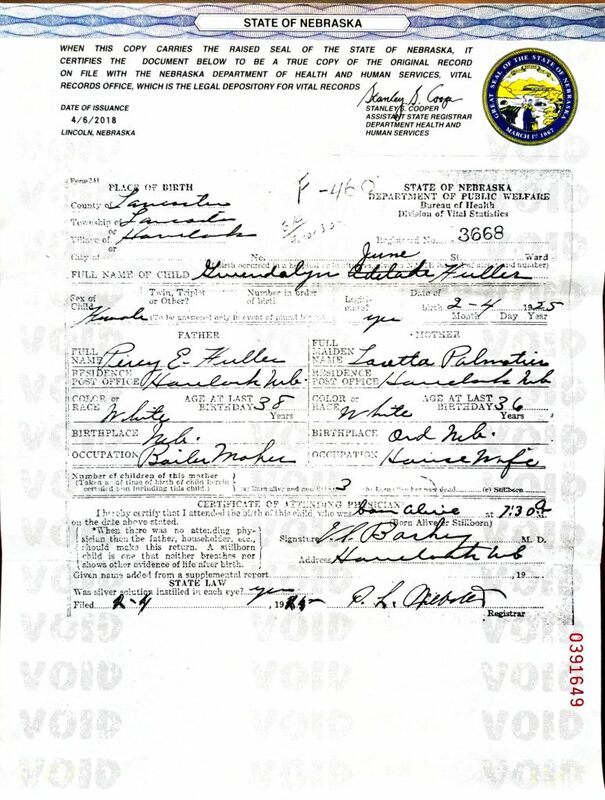 It was not far from that time that Palmatier came to Valley county and filed on a homestead where he later located the post office of Geranium. As the law required residence on the land only a small part of the time, he got out and worked wherever he could to get money to live on. He was helping put up hay on the Calamus between the Skull and the Bloody when he got his first mail job. Another man had the contract but he got Charley to do the carrying for him. She started carrying mail on horse back and carried it until the famous blizzard of 1880 hit on Oct. 15 and 16. His route was between Hartsuff and Fort Niobrara, a distance of 160 miles through the hills. He lost two horses in that blizzard and never went back to the job. It happened that Charley had brought a plug of chewing tobacco at the store. It was about an inch square and four inches long. He broke it in two across his knee and gave the Indian the smaller piece. He looked as though he would like to have the larger piece, but he did not get it. While living in New York state Mr. Palmatier had taken a fancy to a girl somewhat younger than himself, and in 1881 he went back and persuaded Ettie Conklin to come back with him as his wife and make a home for him on his quarter section of land, which he had proved up on that year. 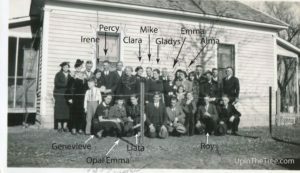 They lived on the homestead and raised a large family of children. Palmatier also carried mail for “Bill” W.H. Williams from St. Paul to Ord and on to St. Helena. He never had a chance to go to school, but nobody would believe it after visiting him. His mind was clear until the last, and he never was at loss for the answers for any questions friends asked him. In the early ‘80s solon Pierson, a brother of Perry and uncle of Claence [sic], started the original Geranium post office. Later John Wolfe took it over and then it went to Herbert Losey. Mr. and Mrs. Palmatier got it from Losey and kept it for some time after the turn of the century, when it was discontinued with the coming of rural free delivery. Mrs. Palmatier had much of the work of taking care of the office while her husband was engaged in other work. There was no salary connected with the office and he got only about $30 for the year’s work, which of course was not worth the trouble. After a while the post office closed at Manderson a few miles north and Geranium got the extra business. H.F. Rhodes was postmaster of the Manderson office. Palmatier did any kind of work he could get in those days. He worked on the railroad between St. Paul and North Loup before the line was extended to Ord. He says that J.J. “Bud” Shirley case his first vote at the Palmatier house in Geranium. When Mr. and Mrs. R.B. Miller, still living in Burwell, were married at the Dies House in Ord, Charley was at the wedding. He was one of the few men still living who knew how to build a sod house. He never belonged to any secret society, and did not believe in them. Geranium was on the wagon route from east to west, and people always planned to stop at the Palmatier home over night. They were always welcome. He lived to be the oldest living mail carrier, the oldest Quiz subscriber and probably the oldest living citizen in Valley county. In 1910 Mr. Palmatier built a home in east Ord and the family has lived there since that time. In 1911 they made a visit to their old home in New York state. He was always a busy man, and had a fine garden at his home when death called him. The fine character of both Mr. and Mrs. Palmatier is shown by the loving care of their children for them. John Buchannan Fuller is my husband’s great great grandfather. I do not know much about John B Fuller. What I do know is that after Percy Fuller and Loretta Palmatier split up in 1920’s, the couple’s daughter went to live with her mother in Chicago. The couple’s two older boys, Raymond and Marshall, moved in with their grandparents, John and Emma Fuller. The household was not an easy place for the grandsons to grow up in. I recently found an index to obituaries in Custer county, Nebraska. Using the index, I contacted the Nebraska State Historical Society to order a copy of the obituary for John B. Fuller. I am so thankful for the archivist who I contacted. Not only did she locate obituary from the Comstock News, she also let me know that there was an additional obituary in the Sargent Leader. Both obituaries have plenty of drama to share. John B Fuller obituary, 15 December, 1938, Comstock News, Comstock, Nebraska, page 1, column 1 and page 8, column 6; Nebraska State Historical Society, Lincoln, Nebraska. Passed Away Suddenly Thursday Morning at Age of 82 Years. With the suddenness of a bolt of lightning came the death of J.B. Fuller, occurring about nine o’clock last Thursday morning, December 8, death being attributed to a heart attack. Mr. Fuller came to work last Thursday morning, evidently in good health, and during the early hours of the morning he joshed with several of his friends. About nine o’clock he was found, by one of the Reckling boys, in his hardware store, sitting in a chair, the boy thinking he was asleep. Being unable to awake him, the boy went for assistance, and it was then found that he had quietly passed away. John Buchannan Fuller, son of John and Marietta Wilson Fuller, was born in Lapeer, Lapeer county, Michigan, November 5, 1856, and departed this life on December 8, 1938, at the age of 82 years, one month, and three days. When a small boy he moved with his parents to Illinois. From Illinois he moved to Cedar Rapids, Iowa, where he grew to manhood. In the year 1878 he came to York, Nebraska, where he met and married Miss Emma Jane Shipman on January 8, 1880, and to this union ten children were born, the three elder dying in infancy. In the year of 1890 he moved with his family to a homestead near Wescott, Nebraska, living there until the spring of 1898 when he moved to Wescott, Nebraska, and engaged in the hardware business. After the railroad came up the valley, he moved his business and family to the new town of Comstock, Nebraska. Disposing of his business in 1906 he engaged in farming until 1918 at which time he disposed of his farm and moved to Comstock. In July, 1925, he again entered into the hardware business which he owned and operated up to the time of his death. While living in Wescott he was active in the Congregational church and Sunday school, and after moving to Comstock he transferred his membership to the First Congregational church of Comstock, Nebraska. 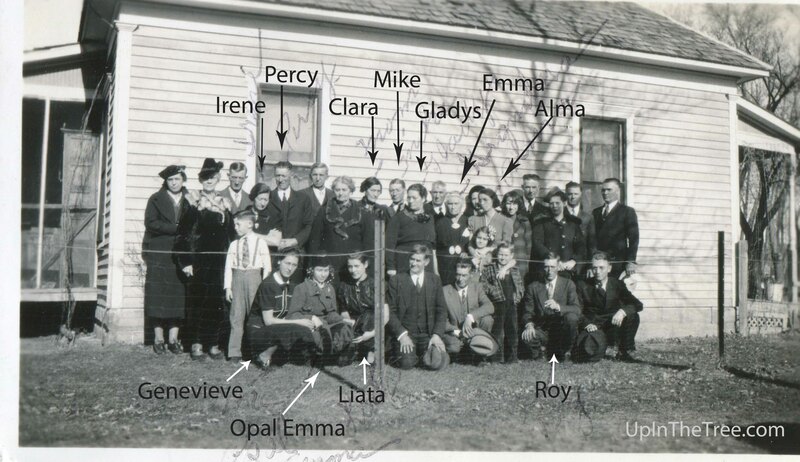 He leaves to mourn his loss, his wife, seven children: Percy E. of Divide, Wyoming, Gladys Eggers, Myrtle Point, Oregon, Clara Smelser, Lincoln, Nebraska, Clarence E. of Martin, South Dakota, Roy R., and Irene Day of Comstock, and Alma Mathauser of Omaha, Nebraska. 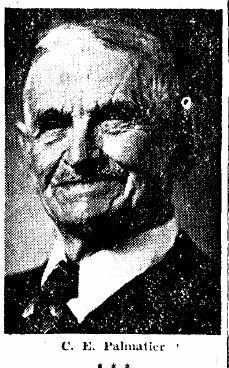 One brother, Irving Fuller of York, Nebraska; 19 grand children; eight great grand children; and many other relatives and a host of friends. Funeral services were held from the Community church in Comstock Monday afternoon, December 12, conducted by the Rev. E. G. Samuelson of Elmcreek, Nebraska, and internment was made in the Douglas Grove cemetery. 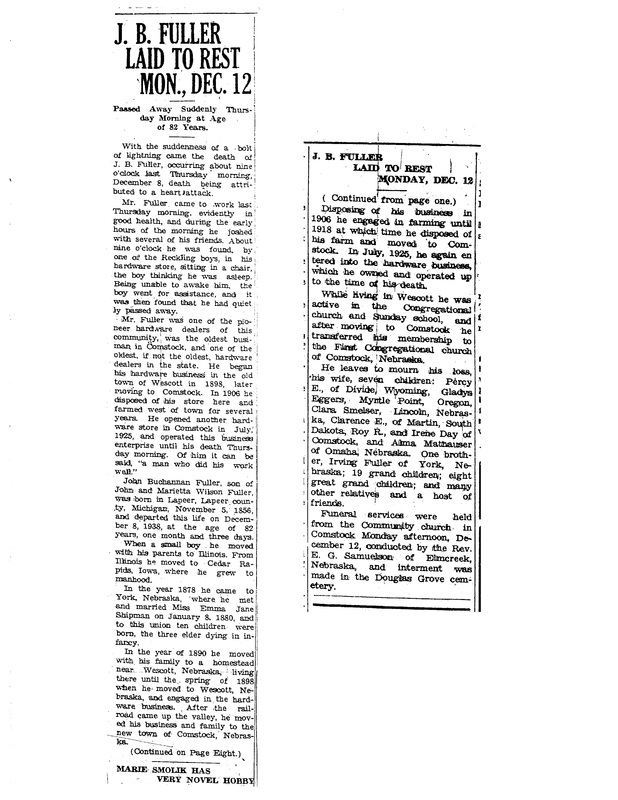 John B Fuller obituary, 15 December 1938, Sargent Leader, Sargent, Nebraska, page 4, column 4; Nebraska State Historical Society, Lincoln, Nebraska. Thursday, December 8, John B. Fuller of Comstock passed away while sitting in a chair in his hardware store. Mr. Fuller had arisen that morning and at the usual time went to his hardware store and built the fire and swept out. In the course of time he was arranging some money in its accustomed place for the days use. While doing this he probably felt coming on the heart attack or whatever it was that caused his death, for we are told that he sat down on a nearby chair, placed is arm over the back and then put his hand in his pocket. This kept him from falling to the floor. Sometime afterwards a small boy went into the store and not being able to get Mr. Fuller to answer his questions, he ran into Orin Mutter’s store and said Mr. Fuller wouldn’t talk to him. Mr. Mutter sensing that something was wrong, sent word to someone else to come and when they entered the store, they found that Mr. Fuller was dead. Mr. Fuller was 82 years of age. He first entered the hardware business at Wescott in 1898, forty years ago. When the railroad came up the valley in 1899 and the new town of Comstock was started, Mr. Fuller moved his store to Comstock and continued to operate it until 1906 when he sold the business to Tom Arthur and Jason Evans. He then moved to a farm southwest of Comstock and farmed for twelve years and then moved back to Comstock. About the year 1926 he started into the hardware business again in Comstock, being sixty eight or sixty nine years old at the time. He continued to operate this business from then until his death at the age of a little more then 82 years. 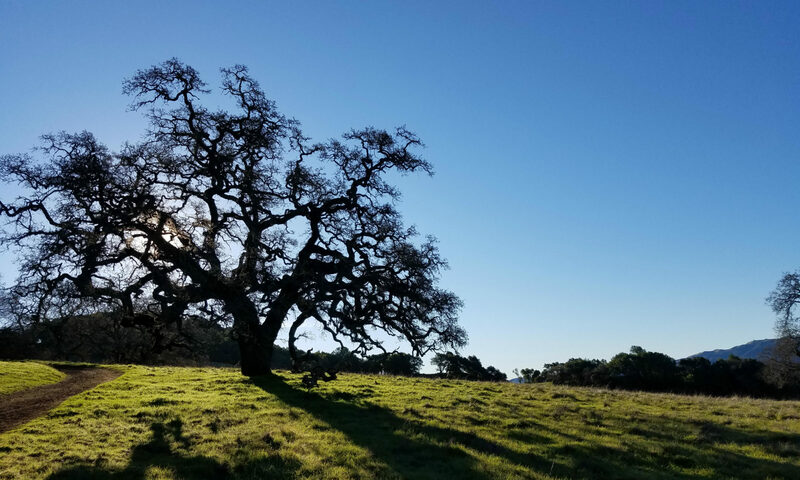 Mr. Fuller’s funeral was held Monday, December 12, from the Comstock church and interment was made in the Douglas Grove cemetery. Fay Spooner was the funeral director. Loy E. Hersh of this city was one of the singers. Etta May Conklin is my husband’s great-great-grandmother. I recently pulled out my husband’s grandmother’s bible to use as an example for how to digitize items using a camera. To my surprise, from the middle of the bible, fell a couple of newspaper clippings. Big mistake on my part to not check the rest of the bible to see if there were any hidden gems. At the same time, I am so happy that I did pull out the bible and find these gems! 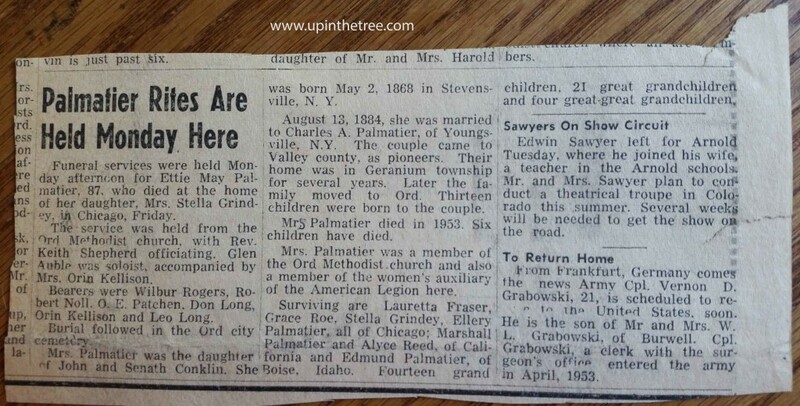 One of the newspaper clippings was the obituary for Etta Palmatier. While I do not know the source newspaper or date it was published. I can make the educated guess it was from Ord, Nebraska. I will follow-up to see if I can find the exact date it was published. Funeral services were held Monday afternoon for Ettie May Palmatier, 87, who died at the home of her daughter, Mrs. Stella Grindey, in Chicago, Friday. The service was held from the Ord Methodist church, with Rev. Keith Shepherd officiating. Glen Auble was soloist, accompanied by Mrs. Orin Kellison. Bearers were Wilbur Rogers, Robert Noll, O.E. Patchen, Don Long, Orin Kellison, and Leo Long. Burial followed in the Ord city cemetery. Mrs. Palmatier was the daughter of John and Senath Conklin. 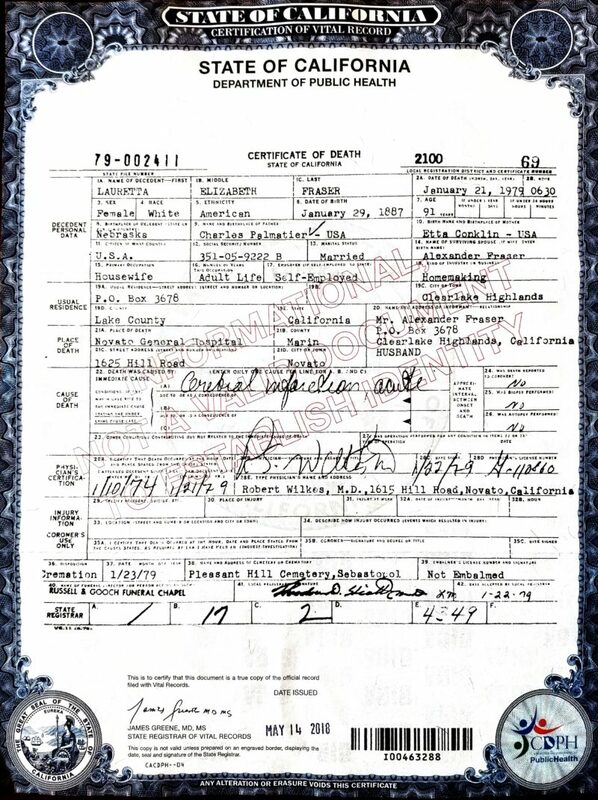 She was born May 2, 1868 in Stevensville, N.Y.
August 13, 1884, she was married to Charles A. Palmatier, of Youngsville, N.Y. The couple came to Valley county, as pioneers. Their home was in Geranium township for several years. Later the family moved to Ord. Thirteen children were born to the couple. Mr. Palmatier died in 1953. Six children have died. Mrs. Palmatier was a member of the Ord Methodist church and also a member of the women’s auxiliary of the American Legion here. Surviving are Lauretta Fraser, Grace Roe, Stella Grindey, Ellery Palmatier, all of Chicago; Marshall Palmatier and Alyce Reed, of California and Edmund Palmatier, of Boise, Idaho. Fourteen grandchildren, 21 great grandchildren, and four great-great-grandchildren. 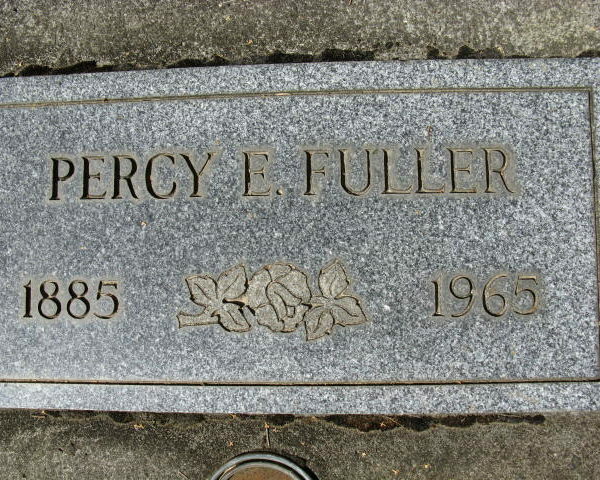 Percy Fuller is my husband’s great-grandfather. He was born 4 June 1885 most likely in Comstock County, Nebraska. He was married to Loretta Palmatier. They divorced when their third child, my husband’s grandmother, was little. After that I have found Percy in Sterling, Colorado and Hood River, Oregon. Percy passed away in Oregon on January 6, 1965. He is buried in Pine Grove Cemetery, Hood River, Oregon. 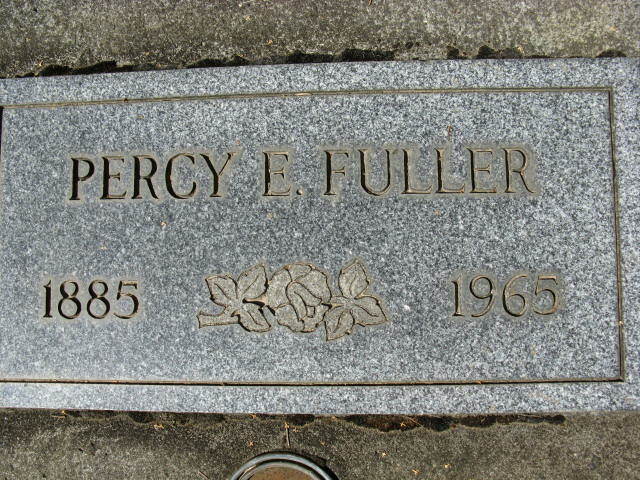 FindAGrave.com, digital images (htp://www.findagrave.com), accessed 9 February 2015, photograph by fred, gravestone for Percy E Fuller (1885-1965), FindAGrave memorial #29641419, Pine Grove Cemetery, Hood River, Hood River, Oregon. I have learned this tip several times in my research history. I was reminded AGAIN this past week. The scene is me sitting in my family room watching TV with my tablet in hand. I was not watching anything in particular and decided to take a look a look at the Ancestry App. In a tangential genealogist (check out this link for a definition) mood, I let myself be sucked in by those green shaky leaves. I have not put a lot of time into accepting or ignoring the suggestions by Ancestry. Most of the time they lead to records I already have documented in my software. All of my dead people have those shaky green leaves screaming at me to give them attention. A click into the black hole of green leaves lead to a list of people who have suggestions. I immediately zoned in on Emma Dovel. She was the first wife of my g-g-grandfather, Abraham Strickler. She died young and there are not many records available for her. I have been trying for years to find out where Emma died. The previous information was light at best. Her son’s obituary said that she had passed away in Kansas City as the family was traveling west. I did not have an exact location or date. I only knew that Abraham and David W (without Emma) were living with Emma’s mother in the 1880 census in Page County, Virginia. Since David Walter was born in 1876 that left a 4 year gap in information. I have searched Find A Grave in the past with no luck for Emma. Guess what the first hint on that shaky green leaf was?! 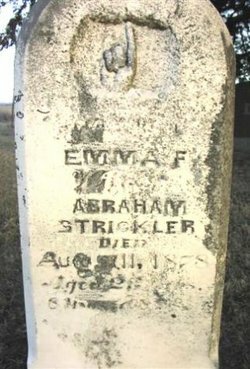 A link to the gravestone photo for Emma Dovel Strickler. Findagrave.com, digital images (www.findagrave.com), accessed 2 December 2014, photograph by Kathy Eltiste, gravestone for Emma F. Dovel Strickler (August 11, 1878 ), FindAGrave memorial # 55549418, Kite Cemetery, Nemaha County, Nebraska. Along with birth and death dates, I now know Emma was in Nemaha County, Nebraska when she passed away. She is buried in the Kite family cemetery. This name is familiar to me as one of the usual suspects in Page County, Virginia. My first hypothesis is that Emma has a sibling who married a Kite and they traveled west together. I will have to do some further research of the other burials in the same cemetery to determine just how Emma and Abraham were related to this group. I also need to check what sources are available for Nemaha County. There may be additional information about Abraham and David Walter there. So check again, and again, and again for information you cannot locate. You never know when and where you will find what you are looking for.